Every child and adult has a kindhearted, confident part of himself or herself – we need to notice and change habits and beliefs that hold us back from our true nature. Our greatest challenge is to be kind to our ourselves, to "heal the shame that binds us". Therapy gives you insight into choices and options you never thought possible. For one hour a week, therapy is an opportunity to be heard, validated, and pause from the distractions of daily living. I have no interest in changing who you are but in helping you achieve your goals and improve your relationships. 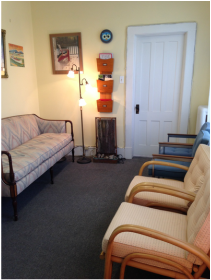 I am located at 2 Frog Hollow Alley in downtown Middlebury, VT.
"My therapy with Doug has given me a new sense of purpose and freedom in my life....BH"